Sew4Home shares a tutorial showing how to make their Canvas Bucket Tote. It’s a roomy bag, measuring in at 12″ wide x 14″ high x 6″ deep. An adjustable strap can be lengthened to carry the bag cross body, or shortened to carry on the shoulder. 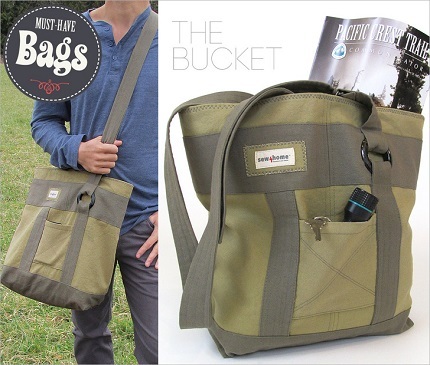 They show it made up in olive drab solids as a suitable style for a guy to carry. But make it from brights or florals or fun prints, and it’s also a cute bag for women, too. Go to Sew4Home for the tutorial.